To Cite: Saberi S, Arabzadeh A, Farhoud A R. Lunate Osteochondral Fracture Treated by Excision: A Case Report and Literature Review, Trauma Mon. 2016 ; 21(2):e22378. doi: 10.5812/traumamon.22378. Introduction: Lunate fracture is a rare injury. Most reports are associated with other wrist injuries such as perilunate dislocation and distal radius fracture. Isolated lunate fracture has been reported even more rarely. The choice of treatment and outcomes are consequently undetermined. Case Presentation: In this case report we will describe a lunate avulsion fracture as an isolated injury after a fall from nine meters treated operatively by excision of the comminuted avulsed fragment. After 33 months of follow-up radiographs showed no sign of degenerative joint disorder on simple X-ray, but slight Volar Intercalated Segment Instability (VISI) by a capitolunate angle of 26 degrees was noted. Clinically, the patient was pain free near full wrist and forearm range of motion and could perform his previous vocational and recreational tasks without any limitations. Conclusions: Despite apparently good short and mid-term clinical outcome, slight volar intercalated segment instability after 33 months of follow-up revealed that lunotriquetral ligament function was probably lost, which led to static instability. This ligament injury may be missed primarily. Excision of the avulsed osteochondral fragment should be the last option of treatment and most attempts should be tried to fix and/or restore the normal anatomy of ligamentous structure. Isolated acute lunate fracture is a rare occurrence, maybe because it is enclosed in the lunate fossa (1, 2). The direction of compression force of the capitate bone during the injury could result in body, volar lip or dorsal lip fracture of the lunate (3). Fresh osteochondral fracture of proximal articular surface of lunate is very rare and fixation of these fractures is demanding. We present a case with only acute isolated proximal articular fracture of the lunate after falling from a nine-meter height, treated by excision of the avulsed segment. The patient was a 34-year-old right-handed dominant male, who has worked as a technician for the national telecommunication company. He was brought to the emergency department of our complex hospital because of falling from almost a nine-meter height when he was fixing the main wires of a phone post. His past medical history was negative for any disease or allergy. At first, measures of basic life support and advanced trauma life support was performed classically because of the nature of high-energy trauma. The patient was alert (GCS: 15) and roughly recall that he had fell on his trunk and right limb. Vital signs were stable during several assessments. Chest, abdomen, spine and pelvic examinations were surprisingly non-significant. Other than some small abrasions and signs of contusion on his trunk, there was an obvious tenderness and limitation of the range of motion of the right wrist associated with moderate swelling and no skin breakage. The neurovascular exam was normal. 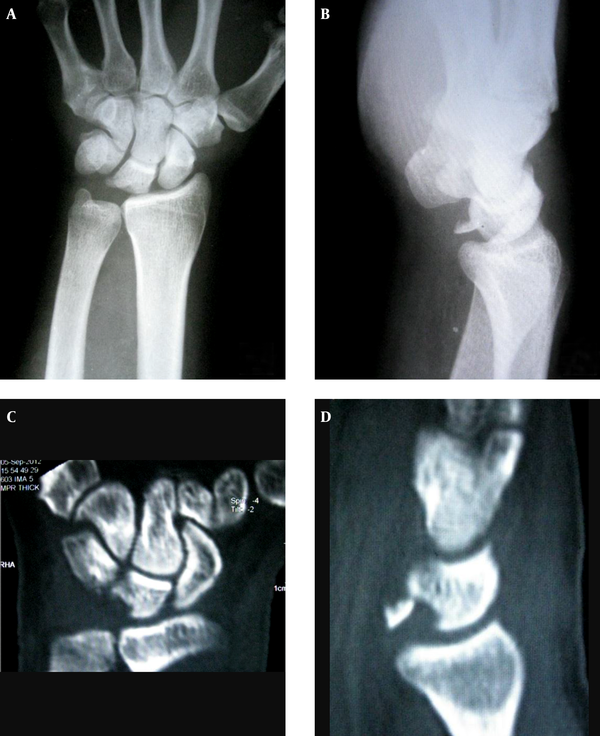 A short forearm splint was applied to the wrist and after patient stabilization, initial anteroposterior and lateral X-ray showed isolated displaced avulsion fracture of the right lunate (Figure 1). Spiral computerized tomography scanning demonstrated that the fragment avulsed from the proximal articulation of the lunate and constituted about 30% of the articular surface (Figure 1). There was no other osseous pathology. Figure 1. Simple Radiography: A, Anteroposterior and;B, Lateral view demonstrate an avulsion from lunate pre-operative CT scan; C, Coronal view and; D, Sagittal view. On the third day of injury, with due attention to noticeable displacement of the fractured fragment and probable ligament injury, we decided to perform open reduction and internal fixation (ORIF). According to the volar location of avulsed fragment, the lunate was approached by an extended carpal tunnel release through a zigzag volar incision (Green 2011). By cutting the proximal half of the flexor retinaculum and retracting digital flexor tendons and median nerve, the palmar radiocarpal capsule was identified. It was intact but hyperemic and incised longitudinally to open the joint. A relatively small (5 × 7 millimeter) osteochondral fragment was in the radiolunate articular space. A corresponding crater, which consisted of about 30% of the palmar half of the proximal articular surface of lunate showed the exact site of fracture. A tenuous soft tissue attached to the fragment that connected it to the radius and was possibly related to the short radiolunate ligament. Of note, the greatest portion of the short radiolunate ligament, other bones, articular cartilage and visible ligaments including palmar lunotriquetral ligament were intact. It was not possible to open the lunotriquetral space by pushing the lunate and triquetrum. Intra-operative imaging by the image intensifier was negative for dynamic or static instability. Being comminuted and failing to reduce the small fragment for fixation by a headless screw caused us to remove the free osteochondral fragment instead of ORIF. The volar capsule was sutured by an absorbable suture. Intra and post-operative radiographic assessments were normal except for the empty site of avulsed fragment. Post-operatively, the wrist was immobilized in a short arm cast for three weeks and then active motion of wrist was begun. Wrist range of motion (ROM) started at three weeks and a wrist support was worn for an additional five weeks. After six weeks, the wrist reached full range of motion without pain. Strengthening exercises begun after three months. The patient returned to his work after six months. Radiographic assessment consisting of stress view at six and twelve weeks postoperatively was completely normal. Final follow up was 33 months after the injury. The patient had no limitation for professional and recreational activities. He could return to his previous work with the same functional level of activity. Except for dorsiflexion loss of 15°, range of motion of the wrist was identical to other sides. Quick DASH score (4) was calculated as 0. Anteroposterior and lateral views demonstrated no sign of lunate avascular necrosis or degenerative joint disease. (Figure 2) Slight volar intercalated segment instability (VISI) identified on lateral x-ray by a capitolunate angle of 26°, which demonstrated early stages of static carpal instability. The patient refused any additional diagnostic (such as magnetic resonance imaging) or therapeutic measure despite being informed about possible complications of VISI. Figure 2. Final Follow-up (33 Months) X-ray : A, Anteroposterior view; B, Lateral view. Lunate fracture actually is a rare occurrence and makes up 0.5% - 6.5% of carpal bone fractures (1, 2). Several reports in the literature described lunate fracture in association with distal radius and or other carpal bones fracture especially perilunate fracture dislocations, yet isolated lunate fracture is really a rare reported injury (5-9). Teisen reported 17 fresh lunate fractures during 31 years, where eight cases had additional fractures (1). Missed diagnosis could be another justification for its rarity (10, 11). As occurrence of isolated lunate fracture is less probable because of enclosing among radius and other carpal bones, diagnosis is difficult especially in non-displaced or minimally displaced cases without cross sectional imaging (3, 10). Additionally, the lunate bone is relatively insensitive because of having the largest cartilage covered area among carpal bones and since cartilage has no nerve supply (12). Although simple radiography is the first step in diagnosis, Galbraith and Richardson emphasized on the importance of applying cross sectional imaging like computerized tomography (CT) scanning and magnetic resonance imaging (MRI) and not only relying on simple radiography to prevent missed diagnosis of this rare injury (10). The usual mechanism is falling on outstretched hands such that the capitate is driven downward into the lunate (3). Hyperflexion and direct below are other possible mechanisms (6, 13, 14). The mechanism of lunate fracture in our case was interesting since it was the main injury of the patient after a high energy falling from a nine-meter height. Stress fracture of the lunate was reported in 2 of 139 elite tennis players by Maquirriain and Ghisi (15). An unusual problem that may lead to incorrect diagnosis of lunate fracture is bipartite lunate, which could become symptomatic spontaneously or after trauma (13, 16-18). Teisen classified 17 fresh lunate fractures into five groups on the basis of radiological appearances and internal vascularity: Group I, fracture of the volar pole of the lunate, possibly affecting the volar nutrient artery (the most commonly reported type); Group II, chip fracture, which does not affect the main blood supply; Group III, fracture of the dorsal pole of the lunate, possibly affecting the dorsal nutrient artery; Group IV, sagittal fracture through the body of the lunate (could theoretically lead to avascular necrosis of the proximal fragment); Group V, transverse fracture through the body of the lunate (1). Our case was type II in Teisen’s classification. Therefore, the excision of the fragment probably did not affect the vascularity of the lunate. However, cartilage defect and degenerative joint changes may be a potential complication. Brolin found two cases of fresh compression fracture of the lunate bone, both treated by immobilization. None of these cases developed Kienbock’s disease. However, four patients with slight compression were not immobilized, due to very slight trauma, and all four developed lunatomalacia (19). Gelberman who claimed that Kienbock’s disease was correlated with the internal and external vascular anatomy of the lunate concluded that repeated trauma with compression fracture and segmental interruption of the intra-osseous blood supply is the most likely cause of Kienbock’s disease, and that patients with only a single nutrient artery may be at the greatest risk of developing avascular necrosis following compression fracture of the lunate bone. They interpreted that a horizontal fracture (type IV Teisen) of the lunate bone theoretically could lead to avascular necrosis of the proximal fragment, yet actually no primary fracture of the lunate bone had been followed by avascular necrosis before their study (20, 21). Teisen et al. followed 11 of 17 fresh lunate fractures for 4 to 31 years. None of them represented avascular necrosis in their simple radiographs. However, they concluded that lunatomalacia may represent overlooked, and therefore untreated, minor fractures where the continuing use of the wrist may lead to non-union and impaired blood supply (1). Therefore, the dilemma still remains. Our case did not demonstrate signs of avascular necrosis at final follow up of 33 months after injury. No consensus has been made to treat lunate fractures. When lunate fracture is associated with other fractures, the need for operation is more obvious. Regarding isolated lunate fractures, they depend on the displacement, site of fracture and the impact of fracture on vascularity and ligamentous stability. Displaced fractures require open reduction and internal fixation, although the traditional trend has been non-operative treatment (3, 14). Teisen et al. did not describe how they treated their cases (1). The treatment method of Cetti and Brolin was immobilization in cast (19, 22). Hsu and Hsu (14) by the dual approach openly reduced and fixed by headless screw a case of type V isolated lunate fracture, three months after injury. Dana et al. successfully applied arthroscopic techniques in inserting percutaneous screw to treat a case of a dorsal pole avulsion fracture of the lunate with a bony fragment detaching the posterior part of the scapholunate ligament (23). Failure to reduce and fix the avulsed fragment because of comminution, the possibility of its avascular necrosis and no significant ligamentous attachment on it justified us to intra-operatively judge on excising the fragment and not to insist on unstable fixation and following complications. The 33-month follow-up and outcome assessment resulted in mid-term proper clinical outcome but radiological VISI was a strong indicator of inappropriate effects of this modality of treatment. Two probable scenarios for VISI in our case were undiagnosed lunotriquetral ligament sprain at the time of injury that resulted in progressive instability and or gradual deterioration of joint kinematics by removing the osteochondral fragment. Irrespective of the actual cause, VISI individually in addition to uneven articular surface of the lunate may lead to osteoarthritis of the wrist joint in the undetermined future. This necessitates sooner treatment at least for VISI that has not been accepted by the patient yet. We think that any attempt to restore osteo-ligamentous structures, and diagnosis and treatment of any occult ligamentous injury by modalities like magnetic resonance imaging and even wrist arthroscopy is helpful to obtain the best results of lunate fracture. Therefore, fragment excision should not be a routine solution for type 2 lunate fractures and other studies with larger samples and longer duration follow-ups are need to know the exact place of this treatment modality in situations that where this is inevitable. We appreciate the patient and his cooperative manner. Authors’ Contribution: Sadegh Saberi was the primary surgeon; Aidin Arabzadeh was the co-surgeon and gathered the data; Amir Reza Farhoud wrote the article, followed the patient, gathered the data and submitted the manuscript. 4. The disabilities of the arm, shoulder and hand score (quick dash).